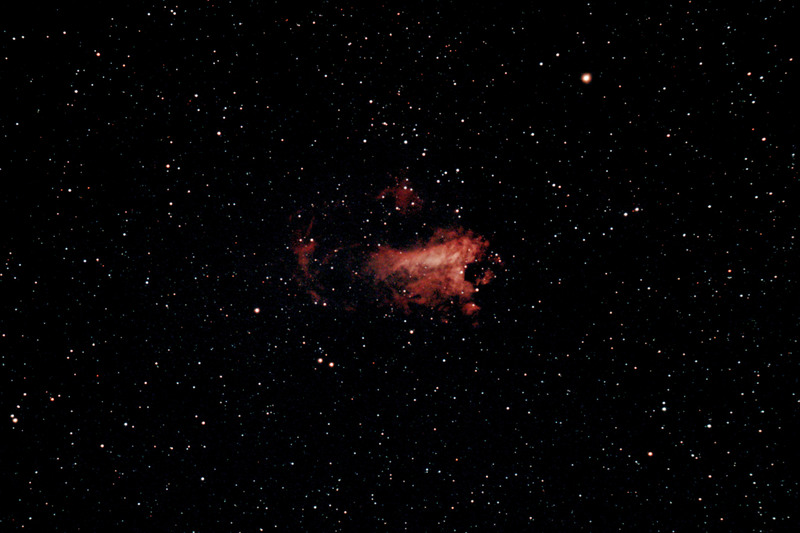 The Omega Nebula, M17, also known as the Swan Nebula, in Sagittarius. 17 x 25s frames at ISO 800. Cropped frame of M27 taken with the C90 for my “C90 Deep Sky” YouTube video. 60s @ ISO 6400. M57 this time. Pleased to see the central star so clearly. The C90 collimation is just right! 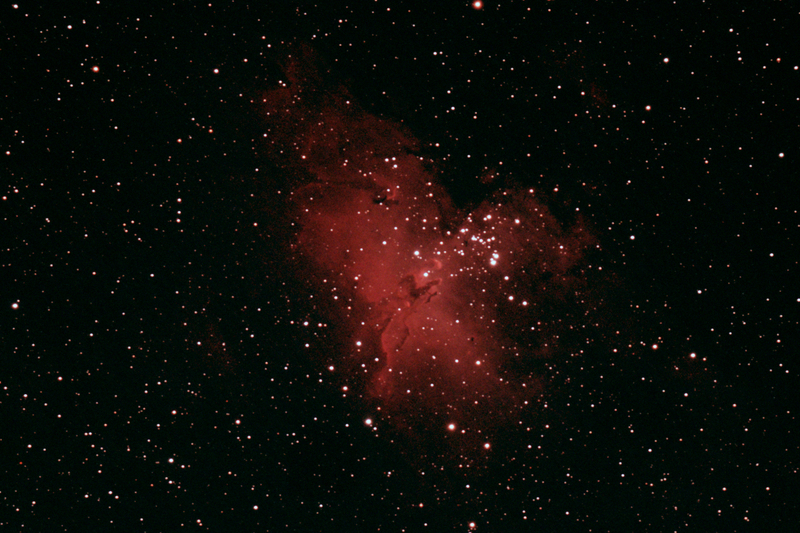 The Eagle Nebula (M16), taken with a William Optics GT81. 60 x 30s at ISO 800. Check out those pillars! 20 x 90s with the GT81. It’s a bit too red! Over eager with PSP! Flaming Star Nebula in Auriga. 34 x 60 frames at ISO 1600 using my WO GT81. First time on this target. It reminds me of M1. Stack of 45 x 30s frames taken with my 50mm lens at f/4, ISO 800. Happy to see the loop! Messier 97, the Owl Nebula, taken with a WO GT81 and Canon 700D. 45 x 75s frames at ISO800. Barnard’s E-Nebula. This time I have used more “curves” in PSP and increased the contrast to try to make the nebulae more prominent. 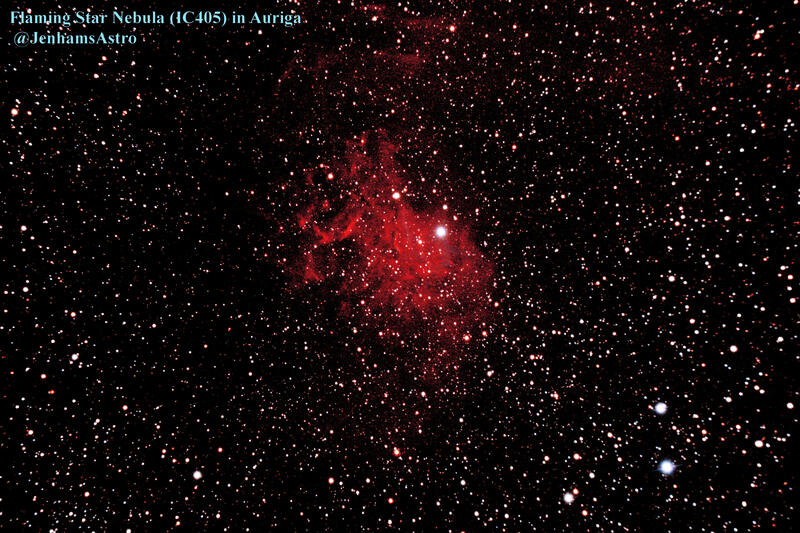 Barnard’s E-Nebula 142 and 143 in Aquila, taken with 30 x 60s subs at ISO 800 using the William Optics GT81. My first shot of a dark nebula. 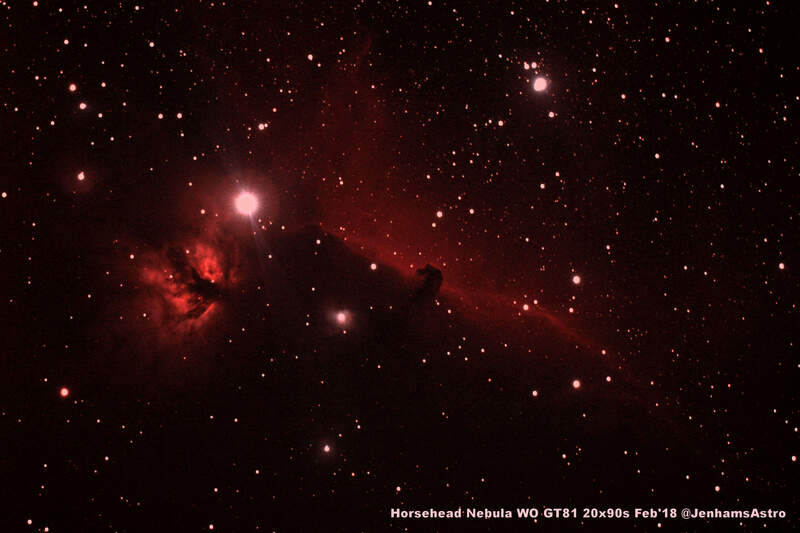 Horsehead Nebula in Orion. My first shot of this target for 5 years. 8 x 60s frames at ISO 800. I intended to take more but the laptop battery ran out! Scope and mount were WO GT81 & Vixen AP. Messier 42. Well why not take another shot! A single 90s frame taken at ISO800. The night had fantastic transparency after a series of weather fronts had cleared the air. Messier 1. Finally I’ve returned for another go at the Crab Nebula using the WO GT81. This shot comprises 10 x 60s frames at ISO 800. Really pleased with the detail. M78 in Orion, a Reflection Nebula which clearly needs more than these 9 x 60s frames (yes, I lost the 10th one in the garden). The Running Man Nebula (NGC 1973/5/7), just north of M42 in Orion. This is taken from a single 180s frame. It deserves to have its own pic, rather than be overshadowed by M42. The colour reveals it to be a Reflection Nebula. 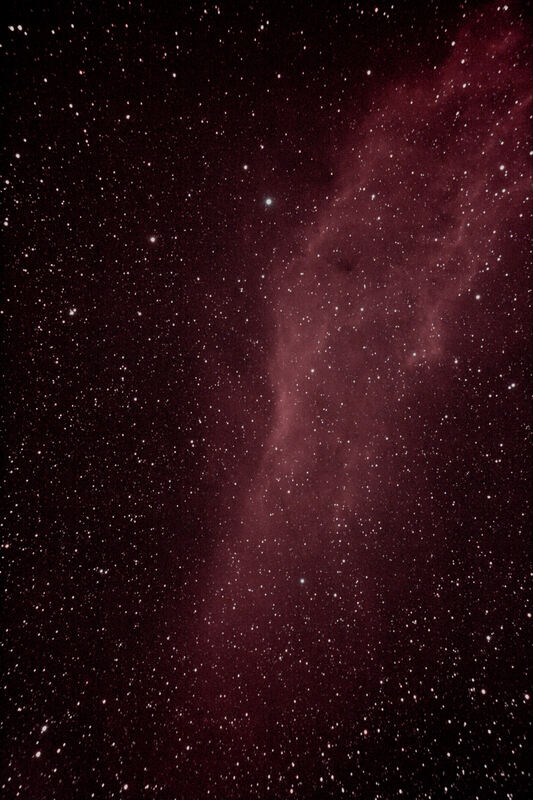 The California Nebula in Perseus (NGC-1499), taken with 6 x 180s frames and 1 x 300s. This is my first attempt at this object, and I spent as long trying to fit it within the boundary of the frame as I did capturing the data. It was a bit like mooring a canal boat – it just wouldn’t comply! 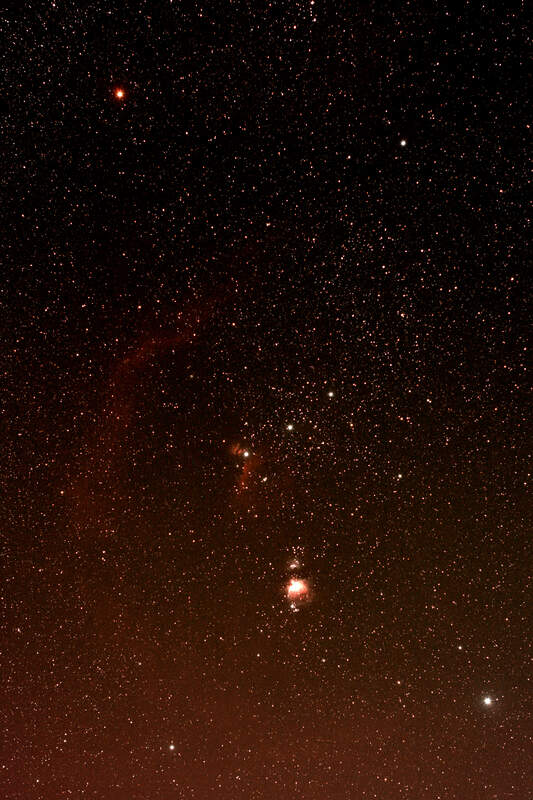 The red emission was clearly visible using 90s frames, which I used to adjust the positioning. Spectacular! Messier 76, the Little Dumbbell Nebula, in Perseus, shot with 10 x 90s frames at ISO 800. It certainly is small compared to M27. It needs more time and processing to extract the full structure of the object. Also called the Barbell nebula. The Rosette Nebula in Monoceros. There are five NGC numbers for this region, four for the nebulosity (NGC 2237, 2238, 2239 and 2246) and NGC 2244 for the open cluster. It is one of those objects that is invisible when you look at a sub-frame; only the tricks of levels and curves make it appear from the black! The Witches Broom Nebula in Cygnus. NGC 6960, which forms the Western Part of the Veil Nebula. NGC 7635 – The Bubble Nebula. I couldn’t believe how well this object photographed, and how appropriately chosen was its name. M27, The Dumbbell Nebula in Vulpecula. The object is one of the few targets that have a wow factor in a small telescope. The egg-timer shape is easily seen visually, whilst a range of colours appear when imaged; no “enhancement” is required! Also known as the Apple Core nebula, apparently. The ghostly face of the Owl Nebula (M97) did not dissapoint when I imaged it as part of an “astro-couple” with the nearby M108 Galaxy. Beautiful. M57 The Ring Nebula in Lyra; a small but perfectly formed planetary that presents as a smoky grey ring when you avert your vision. This image used 15 subframes of 60s each at ISO 800. 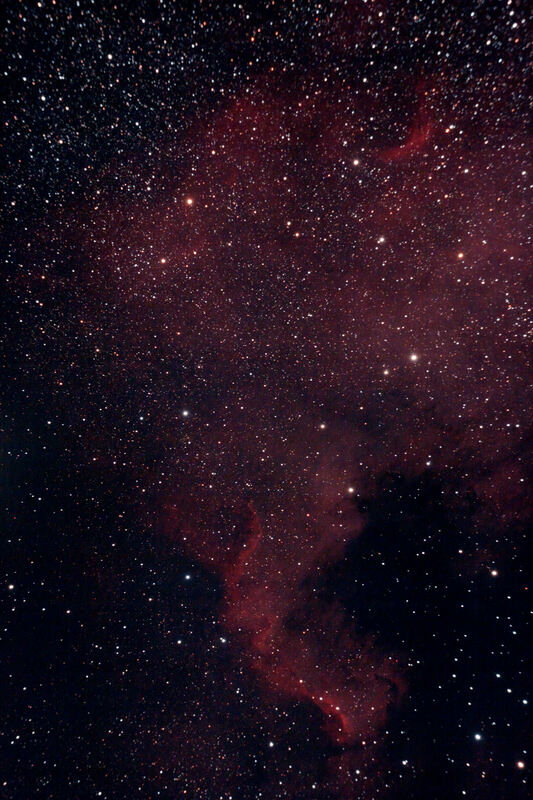 The North America Nebula (NGC 7000) in Cygnus, and surrounding area. Taken with a piggybacked 200mm telephoto lens.